Having overcome some pre-season prejudice caused by his inexperience, a team decision to ban his and his teammate's girlfriends from the garage, pits and team hotel, and a cynical press with little faith in Peter Sauber's ability to spot a rising star, Kimi Raikkonen will have enjoyed hearing the sound of words being munched with rare enthusiasm in the last few weeks. This 21-year-old open-faced, broad-shouldered and straight-talking Finn is a rising star, has phenomenal talent and will almost certainly have a flock of females following him around for months and years to come, whatever anyone may try to do about it. In short, as Frank Williams has recently admitted, he is the newcomer to have made the biggest impression so far in the 2001 season. "Formula One is easier than I expected it to be," he said at Imola. "I was worried at first, more nervous than upset. But it is not so bad. I am getting used to it now. Maybe the worst thing was just the start and getting used to things. When we were told 'no girlfriends' it was a bit of a fuss, you know. But, I am not bothered now by the rules, they are not against me. If I want to bring my girlfriend here now, I can. There are no special races. And about the superlicence to drive in Formula One - I don't think about it. It is not a worry. They will check it, they are just rules -- not a problem." In speech, Raikkonen wastes nothing. Words come sparingly. He talks as he drives, with controlled precision. Speed is gained by the lack of fuss. The message is communicated and he is ready for the next question. 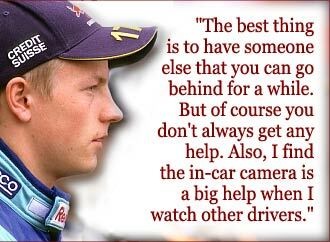 It is not like talking to Keke Rosberg, not quite yet, but there is something of all Finns in this young man with his steady gaze, steady hands and outrageous level of ability. No wonder Peter Sauber is smiling all the way to Maranello for his next batch of customer engines from Ferrari. His only real beef, in the circumstances, will be that the new Finnish superstar may also end up in a scarlet machine, perhaps as Michael Schumacher's next change of partner. However, confusion still reigns over the conclusion of Raikkonen's probation period after the young Finn was voted into Formula One before the start of the season, despite his very limited experience, and he is currently racing on a provisional superlicence. Before the start of the season, Peter Sauber, manager of Raikkonen's team, said that the young star's superlicence would be under review after the fourth race of the season in San Marino, but with that over, the FIA have remained quiet on the matter, and no-one connected with the young star has been contacted. 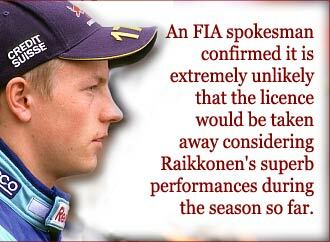 The FIA regulations state that every new driver receives his superlicence on a probationary period of one year, but Raikkonen received his license under exceptional circumstances. The governing body have confirmed that this means he will have his performance reviewed after every three months during his first Grand Prix year, but could not reveal when the superlicence was issued. However, a spokesperson confirmed it is extremely unlikely that the license would be taken away considering Raikkonen's superb performances during the season so far, and added that the probation automatically continues unless there are any problems. But at this time of his career, Raikkonen is not concerned by the supposed uncertainty of his future and he is more interested in learning circuits, people's names and other drivers' good and bad habits. "Yes, this is my first time here, I've never been here before," he confirmed in Imola, at the Autodromo Enzo e Dino Ferrari. "I think it is quite a nice circuit. And for me it is nice to be back in Europe again. The circuit is good. Uphill and downhill which is interesting. I like it. I liked Brazil quite a lot. But they are all different. So far, I have liked them all and they have all been new! "It makes no difference to me that we have Ferrari engines. It means nothing with me or the Italian crowd. I am just driving the same as anywhere. I feel better, now, of course, than at the beginning of the season. I have more confidence. Then I was unsure what it was going to be like in Formula One. Now, I know. There are no surprises I think. I know a little bit now. You always learn something every time you go in the car and you go quicker every time. Now, for me, it is getting better because I am learning more things all the time. I am more used to it and I am getting faster and better, I think. "Of the 17 circuits for this year, I have only driven at Barcelona, and at Spa, Silverstone -- but only on the half circuit, and Magny-Cours in testing. No others. Not Monza. But I think I learn quickly. I have no special system. I just go easy at first and the best thing is to have someone else that you can go behind for a while. But of course you don't always get any help. I haven't asked anyone for help at all. I slow down if someone is coming and they are quicker. Also I find the in-car camera is a big help when I watch the other drivers. "I have done a few races now, yes, but I still don't really know anybody. Not personally. Not the other drivers. It is not like that. I know Mika a bit, of course. He talks to me sometimes at the drivers' briefing. We have a little talk. I didn't follow him particularly, but of course I remember well when he started in Formula One. When I started to go racing, I had no idea that I wanted to go to Formula One. That only started for me in the last two years. And I have been very lucky to have good management behind me -- my main manager is Steve Robertson. "I have always enjoyed motorsport. When I was five or something, I was doing moto-cross and things like that. I liked it. Yes, I could have gone to rallying, but I didn't because my brother was in rallying. I was not going to do the same as him. My older brother and me, we were both in karts and doing OK. I didn't want to copy him. He is nearly two years older than me and his name is Rami. I don't get home much. I have just moved to Switzerland to live in Hinwil. I have been there for four days now. It is good. I have my own place and I like it. But it is difficult to be there very long as we are always away somewhere. It is something I have to get used to..."